9” hidden tang “K-Tip” chefs knife with a one of a kind stabilized box elder in blue translucent alumilite - we dubbed this one "Martian Sunrise"
This was a commission for a competition BBQ Chef who wanted a brisket slicer with a little bit of flair so we came up with a scimitar style brisket knife. The blade is 10" and the knife is 14 1/4" all day. 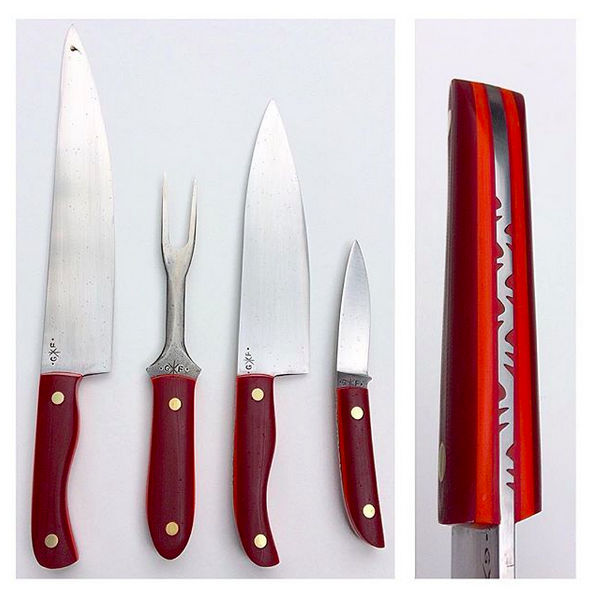 Boning Knife & Oyster Combo - used stabilized wine barrel oak for the handles.